Conditioner is a hair care product, it useful to changes the structure of the hair and brings shine and makes hair beautiful. Usually use conditioner after shampoo to hair becomes soft and shiny; it is also works for hair growth. Conditioner has mainly used for hair care especially for long hair; it helps to manage long hair with silk and shiny beauty. It helps to give strength & texture to hair, moisturize the hair, prevent dry & rough hair, protect damaged hair and make them soft, shiny and good looking. Many people spending too much money on very expensive shampoo and conditioner but not getting the desired results as they expected. Because the reason is that – those products and their marketing is only an attraction for customers. And those products contain chemicals that harmful to hair. Many of the conditioner and shampoo available in the market are looking great and effective but the result is totally different.. Why?. Did anyone think about it?. The mindset of people is melting in busy and sedentary lifestyle and they didn't think about what is right or wrong. Today we are not talking about branded product rather we are discussing on homemade natural deep hair conditioners that much better and effective to make soft, smooth and shiny hair. 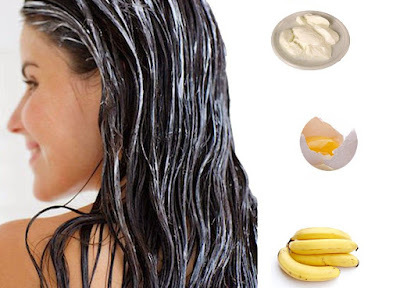 This conditioner is made by the Bananas, Honey, Yogurt and olive oil. Bananas are a rich source of vitamins such as potassium and Vitamin A. Olive oil and yogurt will help to maintain moisture and protein for dry hair strands. Mix well banana and olive oil in a grinder or blender, and therein add yogurt and honey and then mix it well to make a thin paste. Filter it through a strainer before applying to your hair. Apply it to wet hair, and leave it at least for half an hour. Then wash it with clean water. You can also use plastic conditioning cap after apply it on hair; you will get long, smooth and shiny hair along with this natural conditioner. It is the best combination for made a natural condition that prevents hair loss, breakage & split ends. It works for moisturize your hair and make them smooth and shiny. Take egg-white of one egg in a bowl and add 1 teaspoon of olive oil; then mix it properly. Apply it on your hair and leave it at least for 15-20 minutes; then wash thoroughly with clean water. Almond oil and milk are the best source of protein and vitamins. Therefore, it works for moisturize the hair and make them smooth and soft. This is the best hair care natural conditioner. Mix 1 ripe banana, one teaspoon of almond-oil and 2-3 teaspoons of milk and put them into a grinder or blender to make a fine paste. Apply this paste on your hair and leave it for 20 minutes. Then wash it off thoroughly with shampoo or clean water. Avocados are extremely useful to treat dry and brittle hair; it is the rich source of vitamins, oleic acid and essential fatty acids. Honey is a natural moisturizer, it helps to retain moisture, strengthen the hair follicle and best for hair care. Take 1 avocado, 1 teaspoon of olive-oil and 2 teaspoon of honey; mix it well into grinder or blender to make a smooth paste. Apply it on your hair and leave it at least for half an hour. Then wash it off with clean water and shampoo. It is the exceptional combination of natural ingredients helps to prevent hair from oily hair as well as make them smooth, longer and silky. Take a ripe banana, 2 teaspoons of lemon juice and 1 teaspoon of honey; mix it into a blender to make a smooth paste. Apply it to hair and leave it at least for half an hour. Thereafter wash it with clean water. These natural conditioners are extremely useful for your hair care as well as it makes your hair longer, smooth and shiny. It also works to get rid from dandruff, oily hair, hair fall and useful for hair growth.